Lollapalooza, by Aneil Lutchman, CC BY-SA 2.0. Timelines often get a bad rap with students. By the time they’re teenagers, students equate timelines with simple activities they completed in primary school. Illustrate a timeline of your life in pictures. Draw a timeline of the Civil War. Show me your understanding of The Very Hungry Caterpillar with a timeline. However, Unit 3 (Stars and Elements) provides an opportunity for students to dig deeper and gain a new respect for timelines. 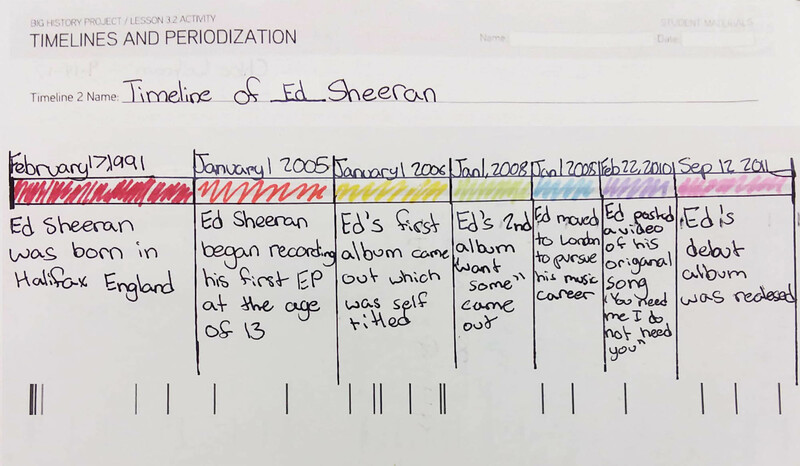 Timelines and Periodizations is an activity in Lesson 3.2 that marries students’ passion for music with timelines and periodization by having students research and create two timelines that each represent a different aspect of music. Students are then asked to divide sections of time into time periods. In my classroom. this activity always gets student jazzed because of the opportunity for student choice and voice. Our school holds the view that personalized learning is a key component to our identity. The activity allows students to experience personalized learning outside of typical computer-based programs. Timelines and Periodizations begins with brainstorming as a class. Students call out different genres of music, new artists they love, and their favorite music fest they attended this summer. For me, this is the best part of this activity. You can see students bond with those they typically wouldn’t over music. Music can push past social pressure and allow students to see each other differently. It has a way of being magical for kids. While working on this activity, students must also critically analyze periodization within their topic. Since these time periods are student-created, they must decipher where periodizations fall by prioritizing events. When working in groups this also provides great opportunity for debate. Timelines and Periodization is key to BHP. This activity provides an opportunity for students to own their learning in an exciting way. One of my students is even using his timeline to create a case for his parents to allow him to attend Lollapalooza this summer! About the author: Brigid has been teaching for Chicago Public Schools for ten years, and has been at Wildwood World Magnet IB elementary school for the last five. She teaches BHP to two sections of eight graders (about 28 students per section). Each period is about 55 minutes long.